The 1890s are frequently called the Golden Age of the Bicycle, and one mustn't look very hard to see why; for if ever there was a time of cycling glory, it was undoubtedly then. However, as the bicycle began to grow from novelty item into a respectable means of transportation and recreation, much of the public was still unable to procure a cycle because of the surprisingly high cost. This was to change in 1893, however, as cycling companies lowered the cost of most safety bicycles from about 150 dollars to about 85. (Smith, 26). Increased affordability made for increased desire for the bicycle and between 1890 and 1900 the bicycling industry went from twenty seven companies employing about 1800 people to over 300 companies employing about 18,000 workers. (Dodge, 116). This massive industry coupled with America's growing love of the two-wheeled contraption made for a country brimming over with bicycles, and it's estimated that by 1896, at the peak of the craze, there were over 3,000,000 bicycles in the United States. The bicycle, once the tool of the rich and now democratized to the point that most who wanted one could have one, increasingly became a means by which to see and be seen. Although now widely available, the bicycle was still trendy, and many urban areas developed all sorts of ways to take advantage of the boom, from fashionable bicycle boutiques, to countless riding academies, to bicycle rental outlets, where those who found themselves without a cycle could quickly, albeit temporarily, fix the problem. Bicycle expositions, where companies could show off their latest wares, also proved to be wildly popular, and one Chicago exposition counted 100,000 patrons in one week in 1896. 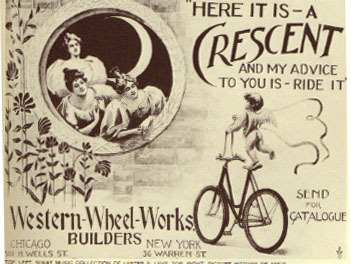 The cycle's relative accessibility coupled with the sense of freedom it lent its rider led many to praise the device as a great leveler in American society. Despite the fact that a cycle still cost a fair amount, writers frequently editorialized on behalf of the cycle as a tool that was adding to a new sense of egalitarianism in this heavily stratified country. An article in an 1896 Scientific American breathlessly praises the "universal fraternity" that has put all on "equal terms" and notes that "as a social revolutionizer it has never had an equal. It has put the human race on wheels, and has thus changed many of the most ordinary processes and methods of social life." (Smith, 112). Surely, the article exaggerates, although we must assume that the author truly believed his words at the time. Such was the effect of the bicycle on the American mind.